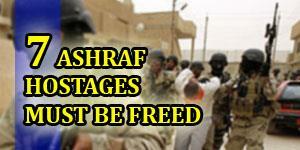 1- Reduce international pressure and give Maliki the freedom to kill or extradite the hostages. 2- Save Maliki and his cohorts from legal and political consequences for this heinous crime against humanity. Iranian Resistance has credible documents and information and trustable witnesses that prove that the massacre in Ashraf was perpetrated by personal orders from Maliki and his Security Advisor Faleh Fayaz at the behest of the Iranian regime and that, to this day, the hostages are in control of Maliki’s special forces in Iraq. These documents and evidence are presentable to any court of law and the witnesses are prepared to testify if their security is guaranteed.